Compassus Hospice is seeking compassionate individuals interested in a unique life-changing volunteer experience. Companion volunteers are needed to visit with people at the end of life, engaging in activities of the patient's choice, such as reading, listening to music, life review, chatting or going outside for walks. 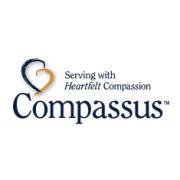 If this opportunity speaks to your heart and you would like to learn more about becoming a Companion Volunteer call our Volunteer Coordinator, Kim Iannacci at 978-777-8222 or email at Kimberly.Iannacci@compassus.com. A caring heart and a smile! Also a background check, training and 2 step TB test are required. must be 18 or older.